people face on the spiritual path." 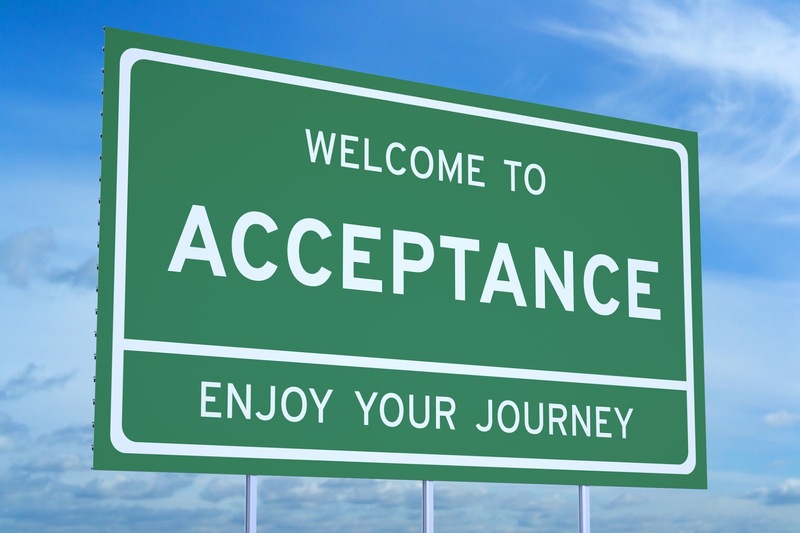 In her book, Radical Acceptance, Tara Brach states that "radical acceptance is the willingness to experience ourselves and our lives as it is." She asks the question, "what would it be like if I could accept life--accept this moment--exactly as it is?" As she began understanding this idea, she said, "I found myself praying: "May I love and accept myself just as I am." Another quote from Tara in this book: "As a friend of mine put it, "Feeling that something is wrong with me is the invisible and toxic gas I am always breathing." When we experience our lives through this lens of personal insufficiency, we are imprisoned in what I call the trance of unworthiness. Trapped in this trance, we are unable to perceive the truth of who we really are." This book awakened me to some inner dialog that I didn't realize was going on to the degree it was. So many of those thoughts tip-toeing around in my brain were about not being enough, feeling I should be more, different, better, more in control, feeling out of place, and even a little unworthiness. And, rather than accepting this as it is, I've spent more energy trying to change those thoughts to something more and better, if that makes sense. I never really paused to look at that. These thoughts and resultant feelings are subtle. Paying attention to calories on a food label, stepping on the scale and not liking the number I see, thinking that I shouldn't be doing certain things, thinking I should be doing something more important, better for me, wondering why I keep doing certain things in certain ways, and much more. Don't get me wrong, all of this is true and it is mixed in with all kinds of appreciation, joy, wonder, awe, and delight. And because it is subtle, I've not really looked at it, not really accepted it as the way it is. I am thinking more along the lines of I shouldn't be thinking these things, or something is wrong with me that needs fixing. Perhaps we all "breathe that toxic gas I am always breathing" to one degree or another. So Tara's question is so appropriate to repeat here: "What would it be like if I could accept life--accept this moment--exactly as it is?" What if I could accept myself exactly as I am right now, this moment? What if I could allow those thoughts to be real instead of trying to not have them? What if I could pause and just notice them and what they are saying, accepting them as they are, without attaching myself or any energy to them? It seems contradictory sometimes to be thinking and feeling these things and professing positive, enlightened, and empowered thought, and that reminded me of one of Walt Whitman's famous quotations on that subject: "Do I contradict myself? Very well, then, I contradict myself; I am large--I contain multitudes." Perhaps Tara Brach is right: "awakening self-compassion is often the greatest challenge people face on the spiritual path." I know that it is awakening within me, if only in small steps toward that fulfillment. We all need to consider giving ourselves a break. For our thoughts that don't serve us. For our acting without thinking it through. For not accepting our life and ourselves as we are right this moment. For so-called mistakes made recently or long ago. For not accepting our own contradictions. As we pause, and look at that which is going on right this moment, and see it for what it is, as it is, we give ourselves the power to view it curiously, and without animosity. Wouldn't that also be a great way to look at what goes on at our job too? It is what it is. Look upon it curiously, and without judgement. And, our personal relationships. Pause. I see my wife is upset right now. I see my son is angry right now. I see my husband is impatient right now. I'm seeing what I'm seeing as if I'm not attached to it. It has no power over me. I accept it as it is at this moment. I can love them anyway. I can love myself anyway. I can love my life right this moment anyway. I can be at peace anyway. Pause. Pay Attention. Accept. Love. Spread Some Joy Today--especially by loving yourself as you are. You are! What a wonderful thing that is. You are. I am. We are. Life is good.